We take a deep look at the game of Spire Institute (Geneva, Ohio) senior LaMelo Ball, who for all intensive purposes is the most popular high school player ever. We know all about the hype, the signature shoe, the FAB 50 National title as a 5-foot-10, 14-year old freshman, and his stint in Lithuania. What is hardly ever talked about and broken down is his actual game. Is he an NBA prospect? Does he deserve accolades as a 2019 prospect? We got our first glimpse of LaMelo Ball as an 11-year old at various Southern California grassroots camps and showcases playing with his older brothers. The first thing we noticed was his fearless attitude and his knack to make the big play. That has carried over to his fourth year at what is considered the high school level. By consistently competing against older players as a pre-teen, Ball gained the ability to patiently find his spots and figure out the most effective way to score and make an impact. Lavar Ball, his well-known father, definitely did the right thing by playing him up and letting his youngest of three sons get a taste of big-time grassroots basketball. We also saw him playing and enjoying himself around gyms during Lonzo Ball’s freshman season at Chino Hills High School (in 2012-13) and one of the first things we noticed was his awkward motion and release on his jump shot because, as many young players do, he started shooting the long 3-pointer at such a young age. It went in many times, but it was something that eventually needed to be addressed. He also leaked out on many possessions and played a gambling style of defense because he obviously wasn’t big enough and strong enough to rebound or effectively stay in front of most talented 17U guards. When he entered Chino Hills (Calif.) as a 5-foot-10 freshman starter, he was still the baby-faced and flashy guard social media began to fall in love with the summer prior, but he knew his role on a team that was led by his oldest brother Lonzo (the eventual Mr. Basketball USA choice as national player of the year for 2015-16). He picked his offensive spots and was smart enough on the court to not attempt to do too much on a team that featured two 14-year olds (the other being current USC recruit and Chino Hills senior Onyeka Okongwu) and went 35-0 to finish the season as the No. 1 ranked team in the nation. The following season (2016-17), Melo Ball was one of four returning starters off Chino Hills’ mythical national championship team and, while considered a top 20 national prospect in the 2019 class as a rising sophomore, this was the high school season in which he began to show signs of being a legitimate NBA prospect. Melo was a legit 6-foot-1 and pushing 6-foot-2 at this time. He had the ball in his hands a majority of the time with Lonzo off to UCLA. He displayed improved explosiveness and more potent scoring ability around the basket, while maintaining a healthy dose of flashy ball that was beneficial more often than it was detrimental to the team. Chino Hills eventually ran its winning streak up to 60 games, as the Huskies challenged the long-standing state winning streak of Compton High School (66 in a row between 1967-69) before falling to Oak Hill Academy (Mouth of Wilson, Va.) at the 2017 Nike Extravaganza. Ironically, in defeat Melo might have played the finest game of his high school career, going for 35 points and getting into the key at will against a senior-laden team stacked with D1-bound talent. More than one McDonald’s All-American voter in attendance that day called him a Top 15 recruit in 2019. In his very next game, Melo Ball went for 92 points and from that point forward, much of his play seemed orchestrated and more along the lines of what we saw from him in his Big Ballers VXT uniform as his father’s relationship with then first year Chino Hills head coach Stephan Gilling deteriorated. That gradual disconnect reached a boiling point in the team’s CIF Southern Section semifinal loss to Mater Dei (Santa Ana, Calif.) when many of Melo’s shot attempts were ridiculous and not helping his overall development. Where would his game go from there? In the fall of 2017, Chino Hills got a new coach (Dennis Latimore) who wanted to run the program his way and feature Okongwu more in the offense. That didn’t sit well with Lavar Ball, who pulled his youngest son from high school basketball before his junior season began. Now about 6-foot-4, Ball spent 2017-18 playing what amounted to barnstorming games in Lithuania and in his father’s upstart Junior Basketball Association (JBA) league. He did get the benefit of playing against older, stronger players and learned some aspects of the pro game, but again the majority of the games were orchestrated to showcase him and/or his brother LiAngelo Ball, who left UCLA shortly into his freshman campaign. Did that pro experience hurt or help him in comparison to the development other elite 2019 players got in a more traditional high school and grassroots setting? The answer is Melo’s game has seen some natural age progression over the past year (he turned 17 in late August), but nothing that couldn’t have been accomplished in a traditional high school and grassroots landscape. 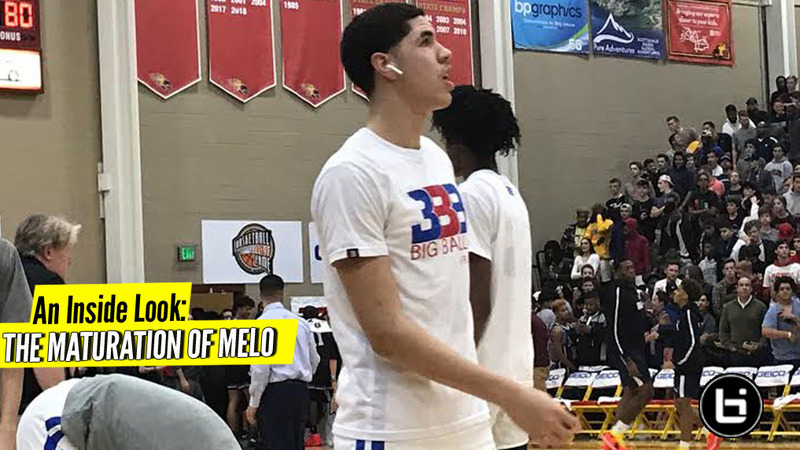 Strengths: It’s uncanny how much the 6-foot-5 (pushing 6-foot-6) Melo Ball resembles his oldest brother Lonzo in terms of size, length and feel at the same stage. He has the same upright game and good instincts on both sides of the ball like his brother. Melo is a terrific passer in the half court and finished Friday’s 85-69 victory over Bella Vista Prep (Phoenix, Ariz.) before a standing-room only crowd at Hoophall West with 10 assists and only a couple of turnovers. Ball is crafty with the ball in his hands and finds a way to get in the key despite lacking that elite NBA quickness and not attacking the defender low. He uses good basketball IQ, keeps his head on a swivel and covers solid ground with the dribble. Melo does what would be expected of a talented and tall point guard with solid leaping ability and legitimate NBA aspirations. LaMelo Ball’s journey taking him away from the traditional American developmental environments (namely high school and travel basketball) didn’t result in a huge uptick in his development, compared to Class of 2019 peers. The 17-year old Ball tracks as a Top 5-12 prospect in the 2019 class (if he were inserted back into credible and mainstream national player rankings) comparable with other top point guards such as Arizona-bound Nico Mannion of Pinnacle (Phoenix, Ariz.) and unsigned Cole Anthony of Oak Hill Academy (Mouth of Wilson, Va.). At this stage, Ball is not decisively a better prospect than either Mannion or Anthony. We asked influencers with all three mainstream rankings services (ESPN, 247Sports.com, Rivals.com) in attendance at Hoophall West if they would insert Melo back into their next player rankings update and one said he would not, one was undecided and one said as long as Melo finished out the season with Spire Institute he felt the youngest Ball brother should go back in the deck. Regardless of whether or not Melo ends up being part of the final national player rankings for the Class of 2019, the likelihood of him playing NCAA basketball is remote. Look for Melo’s camp to seek a spot for him in the NBA G League (the NBA’s official minor league organization) in 2019-20 and, as expected all along since he was at Chino Hills, a declaration for the 2020 NBA Draft. Melo certainly has the talent and pedigree to play in the league, but he’s not a cinch or slam dunk NBA lottery choice. He would benefit from competing more often in high-level games against his peers. He still has a solid chance to land on a NBA roster even though he hasn’t played in many of those types of games in the past calendar year. If Melo Ball does hit it big in the NBA, his unique journey there will only make his must-see story that much more fascinating.